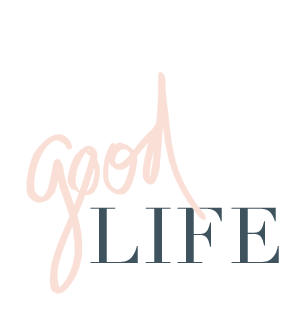 jillgg's good life (for less) | a west michigan style blog: free for all friday: my living room & dining room! free for all friday: my living room & dining room! I'm super pumped for another fun 'free for all friday' where we go super off-script around here and talk about anything and everything but clothing or fashion. 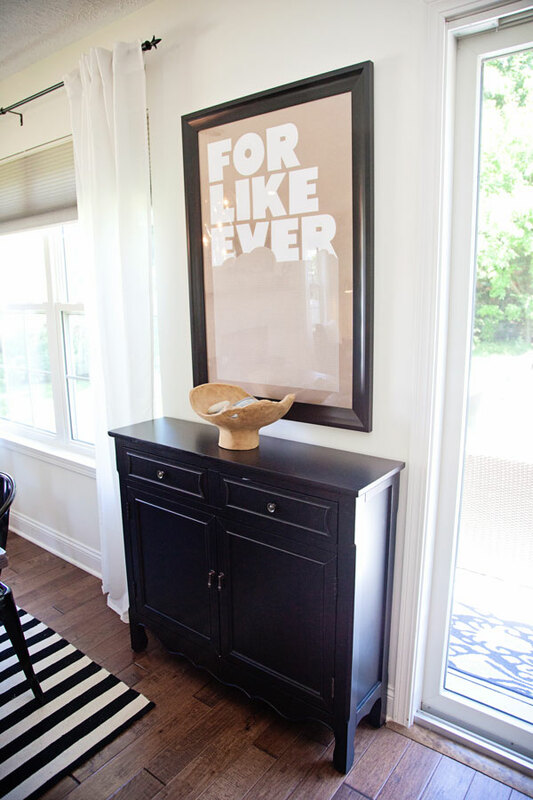 So, remember my fun project with Havenly earlier this summer where we redecorated my bedroom? When my photographer was shooting that project I also had her shoot a few other rooms in the house. So today I'm showing off our living room and dining room combo. One of our favorite (and only) places in the house to hang as a family and also one that I really enjoyed putting together. But first a little back story... so technically this room doesn't look ANYTHING like this anymore. Why? We sold our house! It's been an unusually long and drawn out process but we move next week and we couldn't be more excited to make our new house a home. It's so fun to look at these photos, especially now that our entire life is in boxes and ready for a moving truck next week. But let's get on to the room! 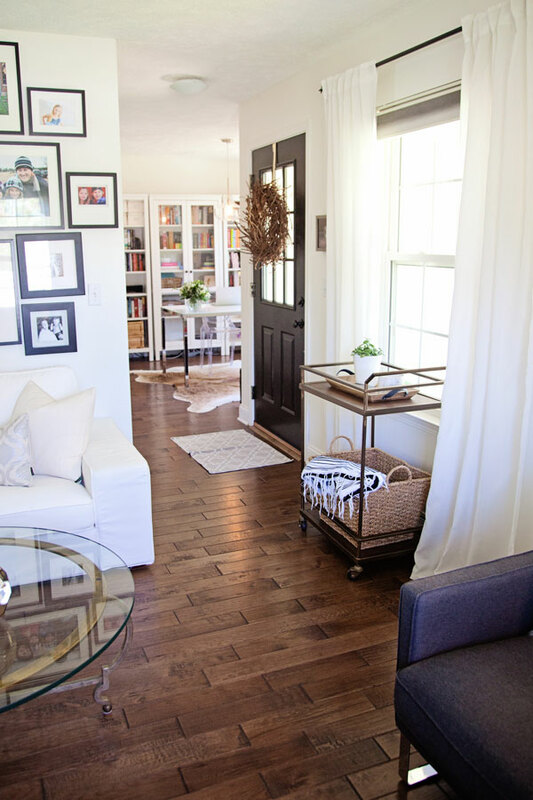 The focal point of this room is definitely the photo wall. As our family has grown up the wall has evolved and we love to look at all the photos as a family and remember all the memories along the way. (Especially the photos of our kids when they were really little... the photoshoots were HELL, but somehow the photographer made our kiddos look like angels and now we are SO thankful for those memories.) Really the theme of this room is family 'mementos' - read on to see how I decorate on a dime with found items for a personal and memory filled home. 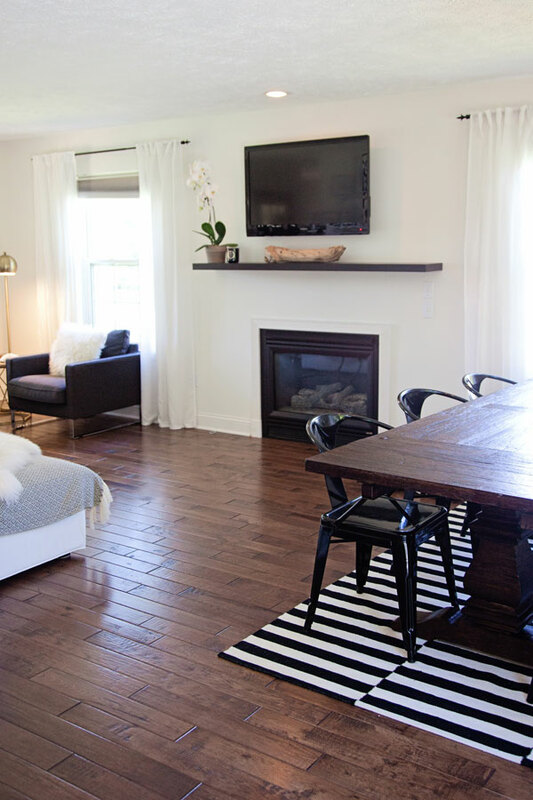 Having this room be the combined living AND dining room had it's challenges, but the bold rug easily separated the spaces visually and decorating the entire space in black, white, grey and other neutrals made both areas come together cohesively. A lot of the decorative items are family mementos too... like this white piece of coral on the side table. I found that at a cheesy shell shop in South Carolina on family vacation. It was a horribly unsuccessful trip (it was cold and raining the WHOLE time) but we still have funny memories from that trip and the little piece of coral tells the story. 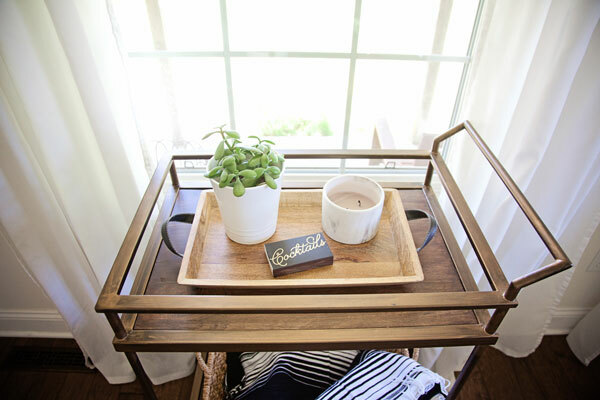 The side table is an inexpensive Target find. I mean, Target can really do no wrong these days! 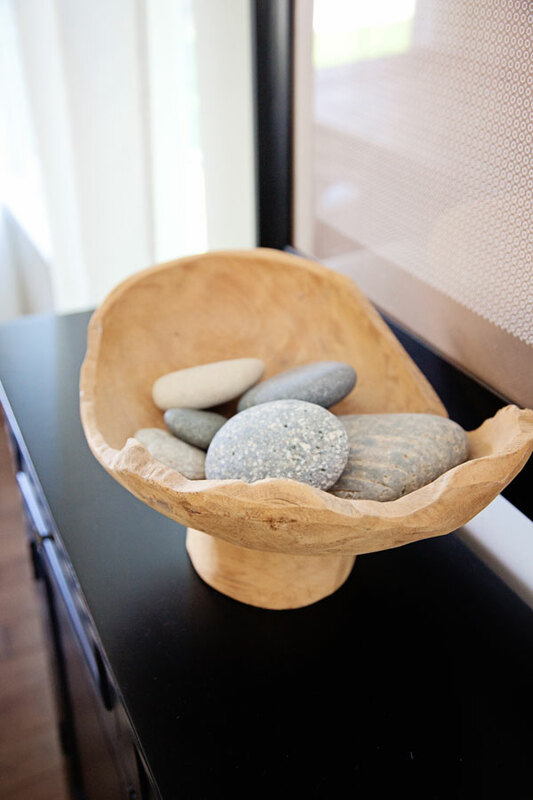 This bowl (similar) was a Home Goods find and the rocks we have collected at the many beaches around the country we have visited. Somehow there is always a rock in our beach bag... together they make a beautiful and unique collection. From this view you can see a little peek into my office... which I will show you guys another time soon! This bar cart is another small space work horse. By day it holds a plant, candle and all our snuggly movie-watching blankets. But whenever we have company over I wheel it outside or to the kitchen to hold drinks or appetizers. The one thing I will miss the most about this room is all the light. There are windows on three walls in here and it's always been bright and welcoming. Plus, it would always feel like living in a snow globe on snowy winter days. This cocktail table was a craigslist find (here is another one I like)... back from my heavy craigslist addiction days. It's always been a favorite. I have a feeling that with a new house there will be lots more craigslist adventures. My husband always loves the days I would call him on the way home from work and say - "We gotta go see about a table!" 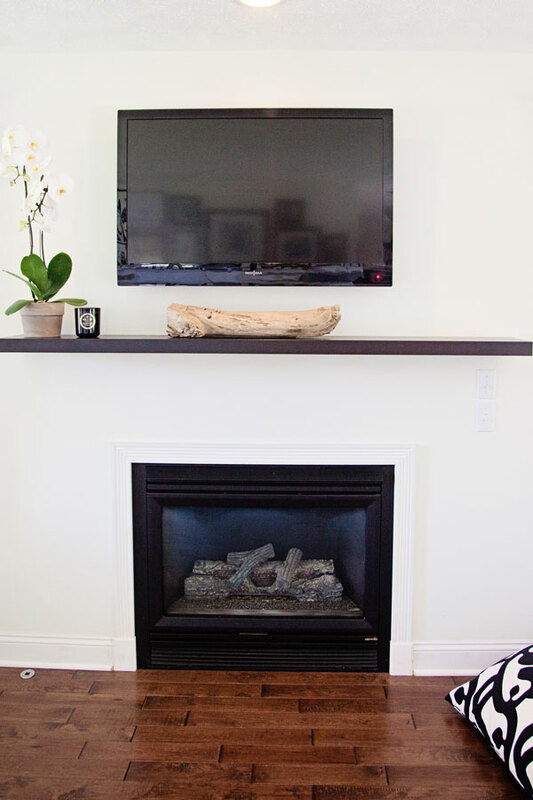 We keep the mantle super minimal since the room is on the small size. It's a simple floating shelf from IKEA for about $30 so it's also very economical too. The large piece of driftwood was another family find at Lake Michigan from when the kids were little. It always reminds me of the crazy days of taking two kids in diapers to the beach (yikes!). The sofa is from IKEA, and yes it's kind of a pain to have a white sofa with kids, but the slip covers are pretty easy to either replace or wash so it's been a winner for our family. Again, with the room being on the small size the white sofa visually opened up the space. 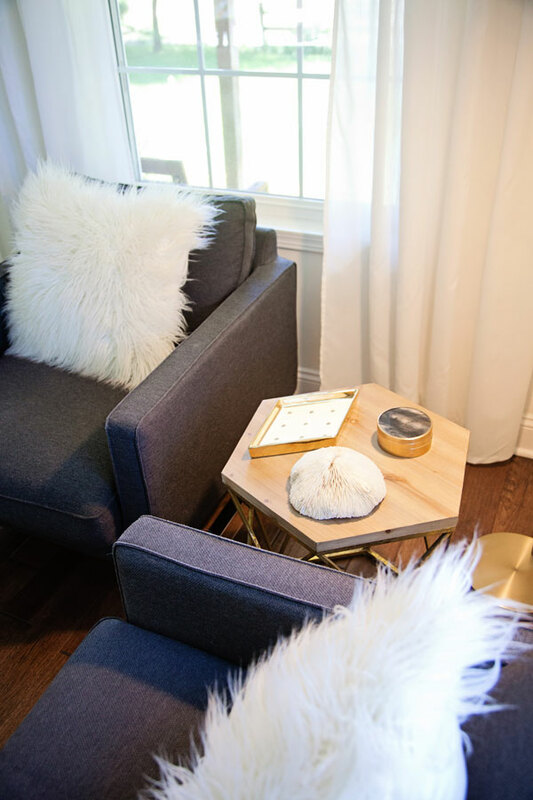 All the throw pillows shown here and the blanket and sheepskin rug are from Home Goods (for online options here are similar pillows here, here and here or a similar rug and blanket). I could live in that place! One of the space "splurges" for our house was putting a huge dining room table in a somewhat small space. I never wanted to feel like I couldn't entertain in a small house so I made the sacrifice to have a big table just in case we wanted to have a lot of people over. We never regretted it either. This table could easily seat 8 and I think we've even squeeze more than that here! Another fun and practically free piece of artwork are these framed feathers my kids found at the park. I popped them in some cheap frames with white paper for a backdrop and voila! 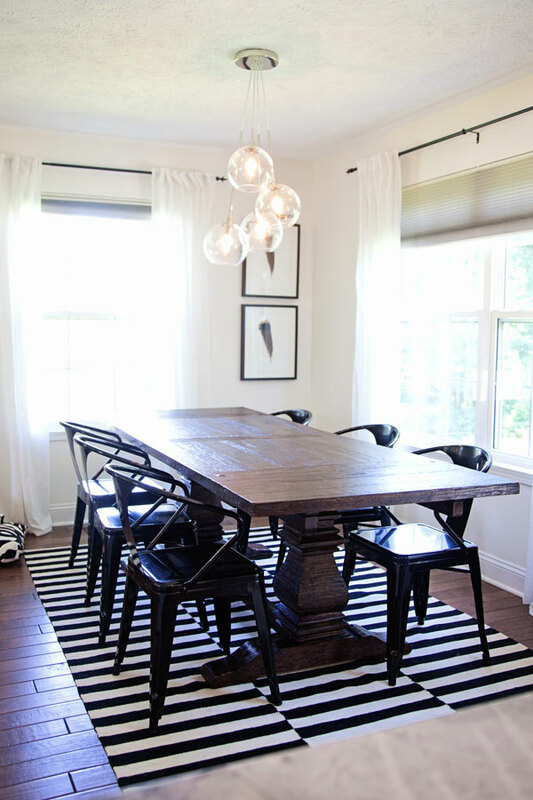 The light is West Elm (sadly not available anymore, but this one is similar), the table is World Market, the chairs are Overstock (similar) and the rug is IKEA (similar). I hope you enjoyed this little tour of my (now past) home! We are so excited to start getting settled in our new home... so stay tuned for more on that. If you have any questions about the room let me know! Or you can shop similar pieces below by clicking on the arrows left and right. I will try to link similar pieces if the actual piece is no longer available.